In Part 1 of this blog, I wrote about my 3 week trial of the Jawbone fitness tracker, in this part I delve in to the Nike+ Fuelband. Is it better than Jawbone? Does it do everything Jawbone does, plus more? Or does it fail dismally? Read on dear reader, read on! I need to come out in the open before I start this review and be honest with you, I’m a Nike fanboy. Have been since I purchased my first pair of Nike runners over 25 years ago. Will this make me bias towards this product? Probably. 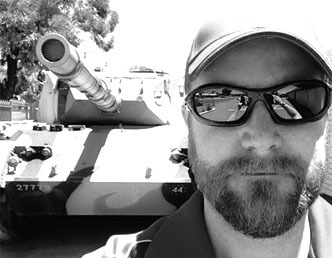 Will that stop me from posting a more than likely bias blog? Absolutely not! Well I’ve been wearing the Fuelband for about 3 weeks now and it’s been getting quite the work out since I’ve started running again. 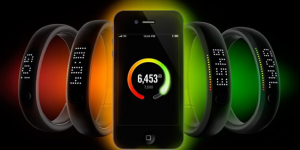 So what does the Fuelband do? Like the Jawbone, it tracks steps, so it’s like a digital pedometer, but it also has a watch function, counts calories burned and converts all that information in to a Nike produced stat, called Nike Fuel. What’s Nike Fuel? Great question and it’s pretty complicated. Essentially it’s just a cool visual aid from Nike to help you with achieving your goals. 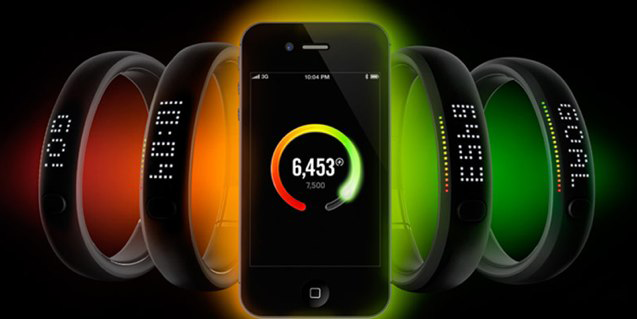 You set it up via the Nike Fuelband app on your phone, or via the website, how much Nike Fuel you’d like to achieve on a particular day. As you get fitter you raise the bar by increasing the amount of Fuel you’ll try to achieve for that day. The LED lights will remind you to get up and move if you’ve been inactive for a set period of time and the coloured LEDs will let you know how close you are to achieving your goal for the day. The lower you set your Nike Fuel Level, obviously the easier it will be to reach your goals, so as you find yourself reaching your goals, if you adjust the fuel level higher, in theory you’ll work harder. LED screen! The LEDs can change from the press of a button to tell you how much Fuel you’ve earned, calories burned and the time amongst other things. While the LED display does give you some warnings about being idle, you really have to be looking at it to notice it. Your phone will also send you the message, but unless the messages are activated on your phone and once again you see them, they’ll go unnoticed. The lack of vibration was something I missed. It’s something Jawbone used well. So how did the 2 sports bands compare? They were close, there’s no doubt about it, but for mine, the Nike+ Fuelband edged out the Jawbone, for a couple of reasons. Bluetooth phone connection and standard USB connection for computer and charging. At the end of the day, I guess it doesn’t matter which one you like best or if you don’t like any of them, if it gets you off the couch and active, it’s a good thing. If you have tried any of these bands or even something different, I’d love to know your thoughts on them in the comments below.